The latest matches in the Bathroom Solutions Blackpool and Fylde Sunday Alliance were preceded by a minute’s silence in memory of Dennis Peters, an outstanding servant of the competition in many capacities, including chairman. Shovels remained top of the Premier Division after they beat Exceptional Kitchens 4-0 with goals from Tyler Atack, Arron Flemming and manager Andy Thompson. Additions stayed second with their perfect league record intact as goals from Ashley Robinson (3), dean Richards and Simon beavers saw them beat Bloomfield Brewhouse 5-0. FC Rangers and Blackpool South shared the spoils with a goal each from Ryan Bradley (Rangers) and Dillon conlon (South). In division one, leaders E and P Publications extended their lead at the top to nine points as they beat Ma Kelly’s Showboat 7-1 courtesy of goals from Chris Gardner(3), Ellis Tortelly (2), Robert Pye and Andrew Duckworth, Aran Bottomley with a consolation goal. The Station Lytham moved up to third as a Ben McKay brace and Harry Greenwood’s individual effort gave them a 3-2 win at AFC Lane Ends Blackpool for whom Ashley Casey scored. New Albert were beaten 2-1 by Anchorsholme with Tom Docherty scoring both Anchorsholme goals and Josh Evans replying. The division two title race took a dramatic turn as lowly Layton Seniors beat leaders McNaughtons 4-3, their first league defeat of the season. Sam Daniels, Otis Lewis-Chambers, Chris whalley and Nathan Bailey scored for Layton with Simon Annetts (2) and Joe Caton for McNaughtons. Clifton took advantage to go a point behind with a game in hand as they edged out Boars Head 2-1 thanks to Steve McEwan and Gavin Martin, Ryan Searle with Boars’ consolation. There was a brace each for Sam Montgomery, John Whittle and Eddie Burke as the George beat Kirkham Town 7-3, while Allan glenny was also on target. Town’s replies came from Stuart Allan, Chris Danson and Michael Morcombe. King Edward beat Marshall court 6-3 thanks to Ryan Willetts (2), Conagh Bootle(2), Jordan Radcliff and Ryan Holland; Stuart Hammond, Macaulay Hoop and Gareth Leadbetter replied. In the Gledhill Cup, division one side Highfield Social beat Premier opposition in Kingsfield, Craig Worrall scoring all three in a 3-0 win. 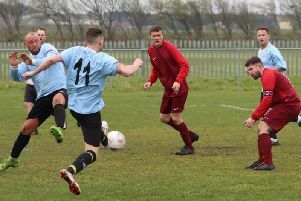 A Carl Eastwood brace helped Blackpool Wren Rovers on their way to a 3-1 win against Hesketh Bank in the West Lancashire Football League Premier Division. He handed them the lead with just 15 minutes on the clock, only for Danny Birkby to equalise on the half-hour mark. But Eastwood bagged his second of the game just after the half-time interview to put them back in front before Aaron Fleming made the points safe 10 minutes from time. The win keeps Wren Rovers six points ahead at the top of the Premier Division, although they have played three games more. Second-placed Garstang kept up the pressure on the leaders with a 3-0 win at Whitehaven. Alan Coar scored on the stroke of half-time to break the deadlock before adding his second, as well his side’s second of the afternoon on the hour-mark. Jonny Hothershall added gloss to the Riversiders’ result with a third. In division one, Poulton remained top of the table after coming out on top in their seven-goal thriller against Eagley. Max Landless opened the scoring for Poulton after 15 minutes, but Eagley came firing back thanks to goals from Simon Whaley and Jon Stephenson to put them ahead. Landless scored his second to get the home side back on level terms only for Stephenson to complete a brace of his own to put Eagley back in front. But Landless completed his hat-trick on the hour-mark before Rob Hanslip scored a dramatic winner six minutes from time. The result means Poulton stay ahead of Hurst Green on goal difference, although the second-placed side did record a 7-0 thrashing of Wyre Villa. Gary Knight helped himself to a hat-trick, Tom Divver bagged two goals while Joshua Briggs and Aaron Davies also found the back of the net. Lytham Town were not in action as their trip to CMB was postponed.